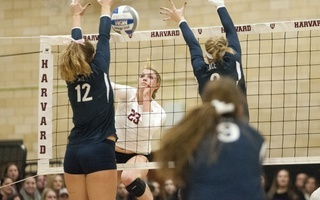 Harvard-Yale contests typically garner huge crowds compared to other games for Crimson athletics, even beyond football. 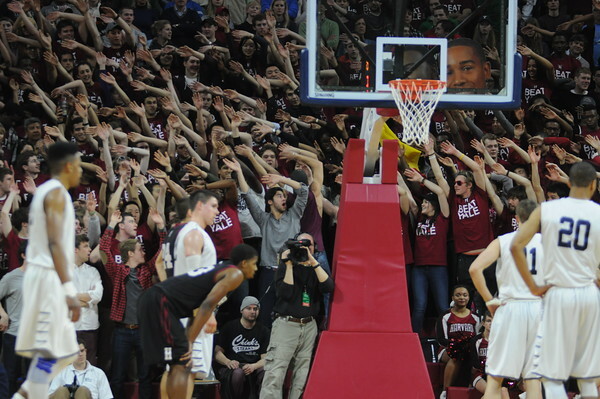 Harvard fans came out in force at the 2015 Ivy League Men's Basketball Playoff between the Crimson and Bulldogs, even though the game was played at Penn. Hyperbole aside, his words still capture the sense of significance that one matchup each year bears for the Crimson and the Bulldogs. The Game brings with it a feeling of importance and tradition that inspires players to on-the-field heroics and elevates the energy and turnout of the students in the stands. At the heart of the excitement and drama lies a rivalry that stretches back a century and a half. Although football may be the most salient part of this competition, the rivalry is a tradition between the two Ancient Eight schools that runs deeper than the gridiron. The rivalry between Harvard and Yale runs all the way back to the inception of intercollegiate sports in the United States. In 1843, Yale founded its own boat club, the first in the country. A year later, Harvard did the same. The two teams practiced on their own until 1852, when the Bulldogs issued a challenge to the boat club in Cambridge. The crews met on Lake Winnipesaukee in New Hampshire for a two-mile race, the country’s first intercollegiate sporting competition. The Crimson crew emerged victorious, and the Harvard and Yale rowing teams would continue to race one another for more than 150 years, establishing not only a rivalry between the two colleges, but also college sports in the United States. Although many universities had sports teams in those days, none of them competed against one another until the Crimson and the Bulldogs raced on Lake Winnipesaukee. Harvard and Yale’s first boat race inspired other institutions of higher learning to face off athletically, and the two schools played leading roles in the development of college sports themselves. Between them, the Crimson and the Bulldogs participated in the country’s first intercollegiate games of hockey, soccer, and five-on-five basketball. Today, with the tradition of intercollegiate athletics well established, Harvard and Yale meet annually to carry on the rivalry established in 1852, not only on the football field and on the water, but also in almost all of the Crimson’s 42 varsity sports. For many of Harvard’s teams, the contest against the Bulldogs is the biggest of the year. This was arguably true for the 2014-2015 men’s ice hockey team. The Crimson met Yale on the ice three times in the first half of last season and came away with the same number of losses. However, the teams squared off again in the best-of-three ECAC playoffs, and Harvard took the first game. The Bulldogs clawed back to win the second contest, but a double overtime goal from junior forward Jimmy Vesey lifted the Crimson to a dramatic victory in the third and propelled Harvard towards the ECAC championship. According to Criscuolo, the team’s satisfaction in the win stemmed perhaps more from snapping a 10-game losing streak against Yale than from advancing to the next round of the tournament. Although the hockey situation of March 2015 was a particularly notable result, games against the Bulldogs bring similar levels of excitement for many of Harvard’s other varsity teams. Part of the thrill comes from the boost that teams get in numbers of spectators when they take on Yale. Harvard women’s basketball’s win over the Bulldogs at Lavietes Pavilion last year drew nearly twice as many spectators as any of the team’s other games, while the women’s volleyball squad saw 100 more people turn out to the Malkin Athletic Center for its home matchup against the Ivy League foe this season than for any of its other regular season contests. After picking up two points during the season’s final weekend, the Crimson received the 11th seed in the conference tournament, earning itself a trip to New Haven to take on the sixth-seeded Bulldogs this weekend.